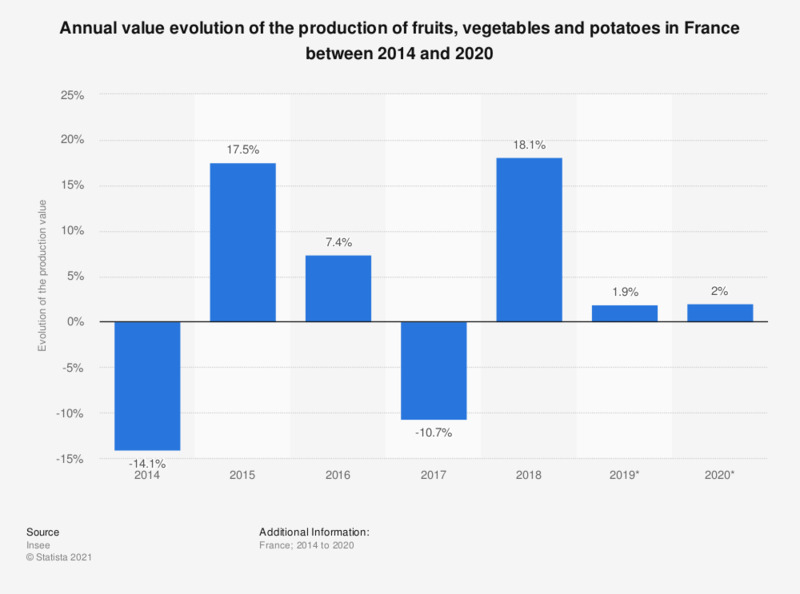 This statistic shows the annual value evolution of the production of fruits, vegetables and potatoes in France between 2014 and 2016. The value of fruit, vegetable and potato production increased of 7.4 percent between 2015 and 2016. The figures for 2014 and 2015 haven been taken from previous publications. The agricultural sector is the grouping of all units of economic activity engaged in the cultivation of plants (including market gardening and horticulture), animal husbandry, custom agricultural work, hunting and related activities. In addition to agricultural holdings, the characteristic units of the sector include producer groups (cooperatives) producing wine and olive oil and specialized units supplying machinery, equipment and personnel for the execution of works. Agricultural contractors: executed without providing the raw material. On a scale from one to ten, how much do you value the following food products?